The paranoia and conspiracy theories continue! Beleaguered reporter Matt Sinkage's quest to discover the truth behind an apparently government-backed alien invasion of earth leads him to investigate a quasi-religious UFO cult based in an idyllic small American community. Then the sudden death of a prominent politician paves the way for Senator Harrison Callahan to seek the Presidency of the United States. But Sinkage, believing that Callahan is an alien pawn, is determined to stop him at all costs. Larry Hancock was born in Toronto, Ontario in 1954. He graduated from the University of Waterloo with a Bachelor of Mathematics and since then has toiled in Toronto as a Chartered Accountant. 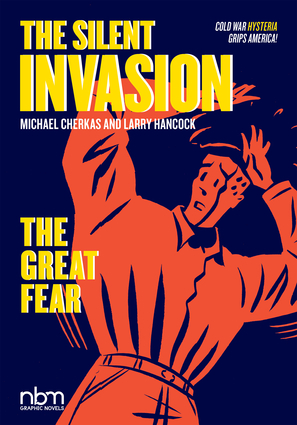 However, counter to the view of accountants as boring, he has written The Silent Invasion and The Purple Ray with Michael Cherkas and Suburban Nightmares with Cherkas and John van Bruggen. Michael Cherkas was born in Oshawa, Ontario in 1954. He has worked for more than 30 years as a graphic designer, art director, cartoonist, and illustrator. His other comics include Suburban Nightmares, The Purple Ray, and The New Frontier.